Background: Using a bacterial expression system such as Escherichia coli (E. coli) is very common for protein expression because of its simplicity, low cost and high efficiency. Objective: In order to express proteins that contain di-sulfide bands, an oxidative space such as the periplasmic environment of the bacteria is required. Therefore, a leader sequence which named Signal Peptide (SP) is needed to direct recombinant protein to fold in periplasmic space. Interleukin-2 (IL-2) is a prominent cytokine which known as growth factor for T-cells and typically produced by a variety of immune cells that stimulate and regulate inflammatory and immune responses. Methods: This study was designed to predict the best signal peptides to express IL-2 in E. coli. To predict the best signal peptides for the expression of IL-2 in Gram-negative bacteria (E. coli), forty-five sequences of SPs were extracted from data base. Some most important details such as n, h and c regions of signal peptides and their probability were studied through the signalP software. Afterwards, physico–chemical features of SPs were analyzed by Portparam and Solpro tools. 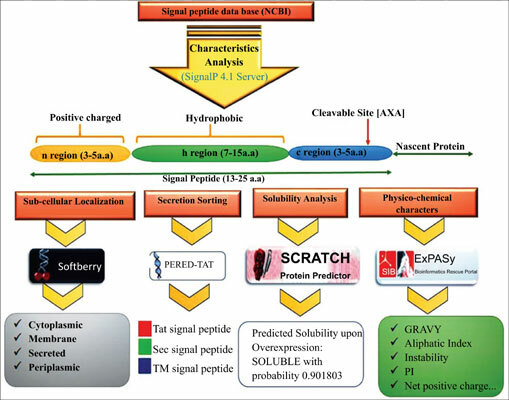 Finally, secretion-pathway and sub-cellular localization sites were evaluated by PRED-TAT and ProtcompB softwares. Results: At the end of the in-silico analyzes, it was determined that ccmH, PelB, traU, yohN, lolA, yhcN are the most reliable SPs, respectively, with highest score and best performing to express the IL-2 protein in E. coli. Signal peptide, IL-2, E. coli, periplasm, interleukin, T-cells, immune cells.